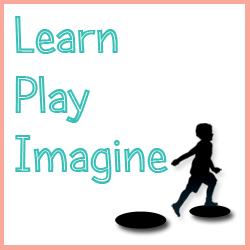 It's Wash and Learn time brought to you by Train Up a Child, Bath Activities for Kids and In Lieu of Preschool. 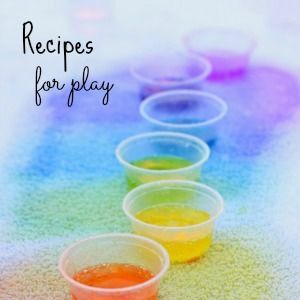 Last week we focused on science, and we made a Toddler Color Mixing Lab. Science week was so much fun that we decided to focus on science again this week! With Earth Day approaching I thought it would be fun to set up a composting bin in the shower. 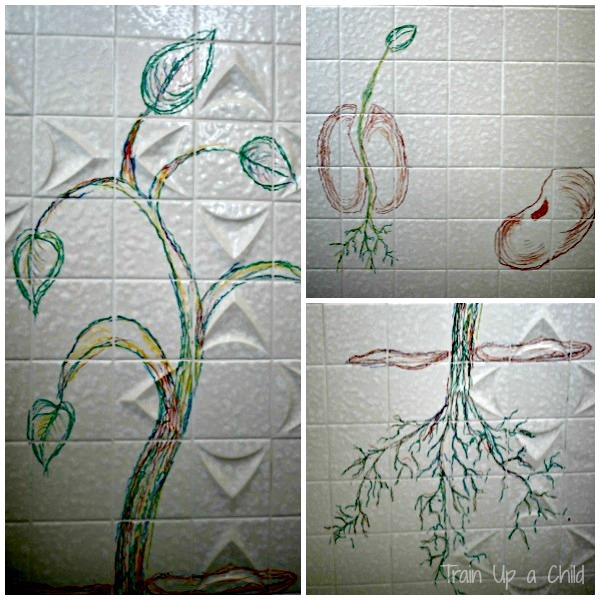 My wonderful husband drew three stages of a plant growth cycle on the shower wall with bath crayons: seed dispersal, germination, and continued growth. We have a compost bin in our backyard. JZ (5) and J-Bug know what goes in the compost heap, what to recycle, and what gets tossed in the trash. I thought it would be fun to set up an invitation to compost through sensory and imaginary play as part of the Wash and Learn series. I placed the splatter screen over the shower drain, so nothing that could clog the drain or pipes could go through. 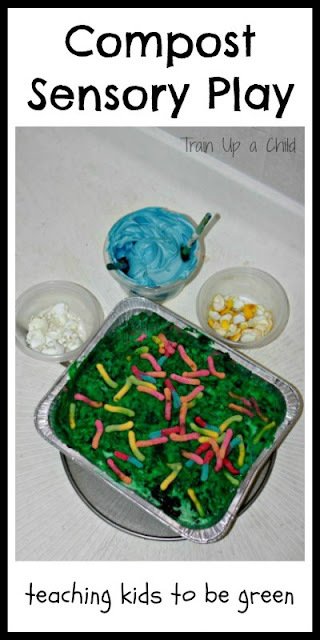 I made the compost bin using dirt dough, a sensory recipe invented by Bath Activities for Kids. Dirt dough feels like real dirt and is 100% bath and shower safe. 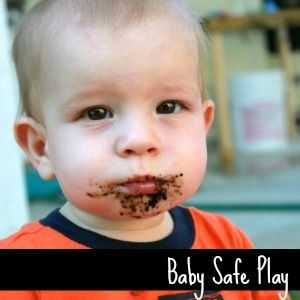 The dirt dough can safely be rinsed down the drain when playtime is over. 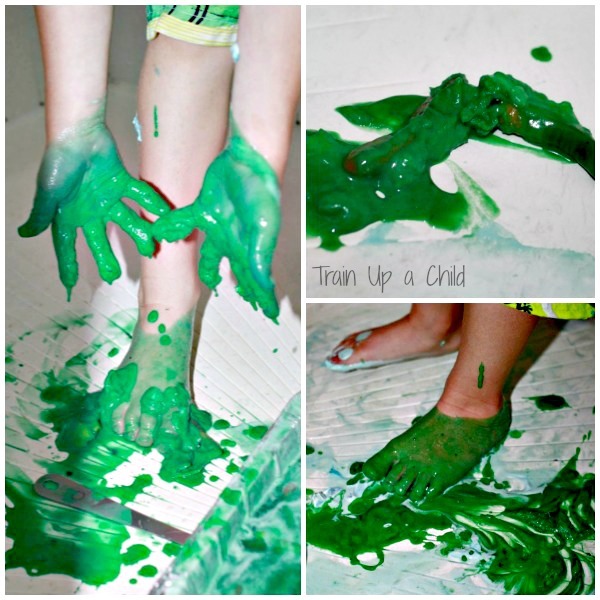 I followed the dirt dough recipe from Bath Activities for Kids substituting green food coloring to represent grass clippings that we throw into our compost heap. I used an entire bottle of green food coloring to achieve the color I wanted. I also added the black paste to make it appear like soil. I used at least half of the tube. The final touch to the compost sensory bin was sour gummy worms! 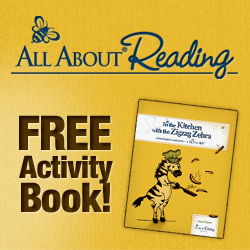 Tip: I bought an extra pack, so the boys could enjoy a treat after our Wash and Learn activity. I knew they would ask to eat a few of the worms, and I didn't really want them snacking during shower play. JZ explored the composting bin tentatively at first. J-Bug immediately wanted to add the lemon peels and egg shells to the compost bin. As soon as JZ felt the dirt dough he eagerly began playing and molding it. The boys enjoyed adding water to the compost bin. I explained that they best way to grow healthy plants includes good soil which we get through composting, watering seeds and plants, and sunlight. 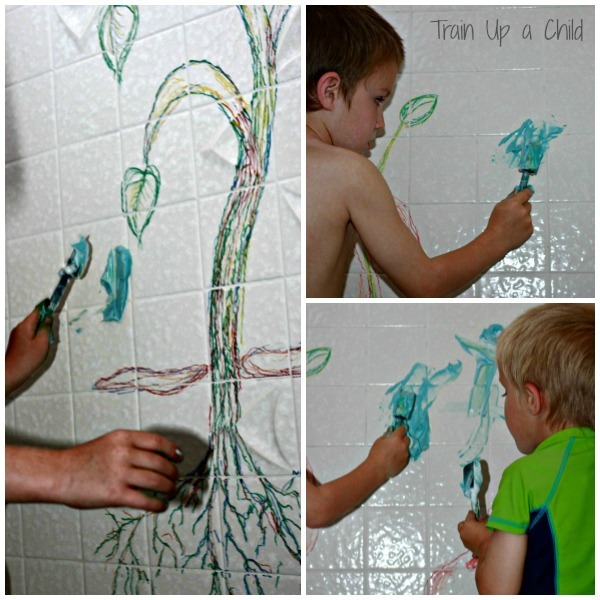 In addition to the composting bin I set out a bowl of blue shaving cream paint, so JZ and J-Bug could paint raindrops on the plant on the shower wall. 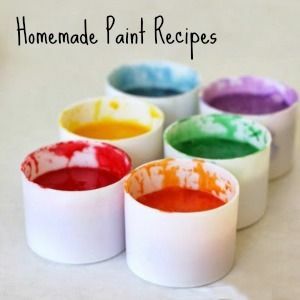 Shaving cream paint is made by combining shaving cream and the color of your choice. It is so simple and takes about fifteen seconds to prepare. In addition to adding water from the watering can, the boys also added the shaving cream paint "water" to the compost bin. Please note that they added quite a bit of water and enjoyed the sensory experience. Per the instructions on Bath Activities for Kids, to make dirt dough add water slowly and stop when the dough has formed. Adding too much water makes the dirt dough dissolve. 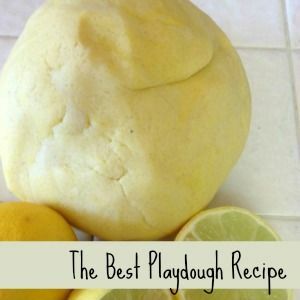 JZ and J-Bug loved the sensory medium the watered down dough turned into, but if you want a true dough like sensory material stick to the recipe. JZ and J-Bug were highly amused when I explained how composting works. They found it hilarious that composting makes soil full of nutrients after food passes through a worm's body. This composting sensory bin quickly turned into a "worm poop" bin. Gotta love little boys! Both boys thoroughly enjoyed our composting sensory bin and imaginative play. As you can see, they really got into it. 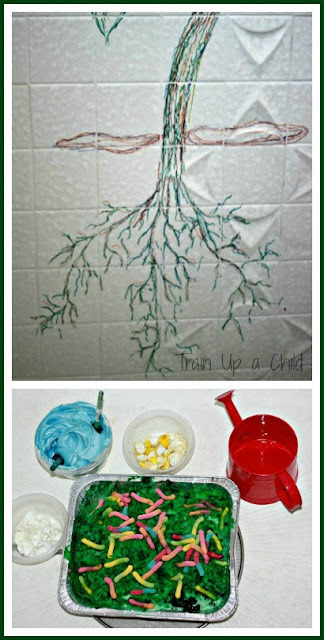 This was by far the biggest mess we have ever made in the shower, but the dirt dough rinsed clean without any scrubbing! We aimed the shower head at all the places the green had splattered, and it immediately washed away. Cleaning the bath crayons took a little scrubbing which JZ was happy to do. For more ideas for fun in the tub or shower follow my Sensory Activities board on Pinterest. 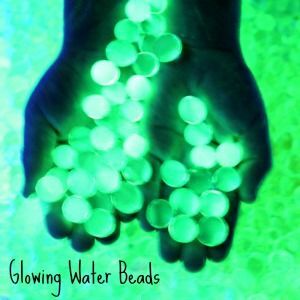 Be sure and visit Bath Activities for Kids to see their Balloon Experiments and In Lieu of Preschool to see their Planet Earth Paintings for science week in the Wash and Learn series. Fun! My son loves the composting episode of Curious George. He used to stuff his rain boots full of fruits and vegetables I had cut out of construction paper. He'd probably really enjoy this once he got over getting messy! Especially if we had some of the different containers George hides his compost in. 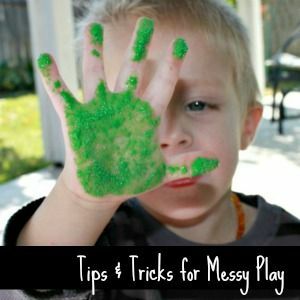 Oh wow that looks like amazing messy fun! Those drawings are fabulous. So much fun! My girls would LOVE this. We'll have to give it a try sometime this spring. 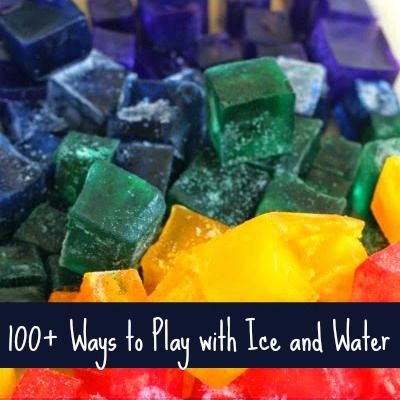 Thank you so much for sharing your idea at the Discover and Explore themed linky. 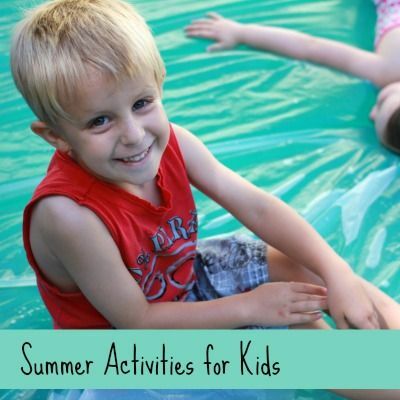 I'm excited to see what you link up next week for the Gardening with Kids theme.